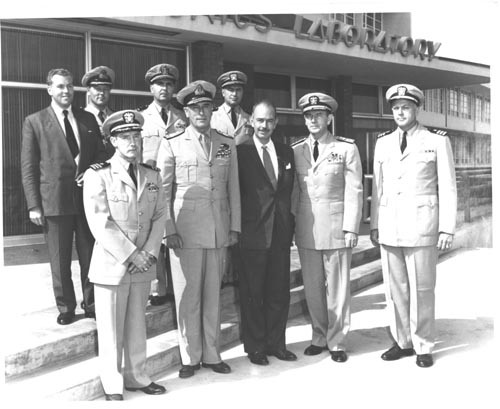 B&W image.Group of U.S. Navy officials with Lord Louis Mountbatten, First Sea Lord, Rouyal Navy. Verso: Attached paper has names and locations of the officials..
Verso: Pencil "NTDS History P. IV-23, line 5 from bottom with line pointing to CDR. H.S. Foote"
"NTDS History P. IV-10 P.IV-12 line 10 pointing to CDR E.C. Svensen"